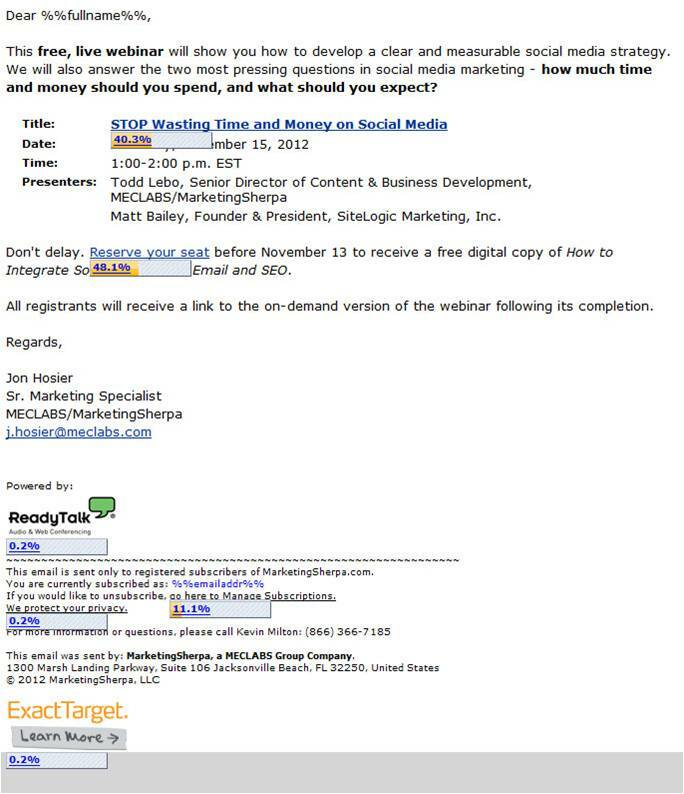 Here’s a behind-the-scenes look at a recent email marketing send to promote a MarketingSherpa webinar about social media, sponsored by Eloqua. I wanted to share it with you, because while it was quite simple to do, the results were pretty impressive. Before we get into it, I want to stress that this was not intended to be a valid A/B split test (there is a validity threat that I’ll get to in a moment), so take the results with a grain of salt. However, it is a good example of sending different versions of an email to different segments of a list. For that reason, this is a tactic we do think is worth trying (and perhaps testing) with your own lists. (Note: The webinar has already taken place, and was quite good. 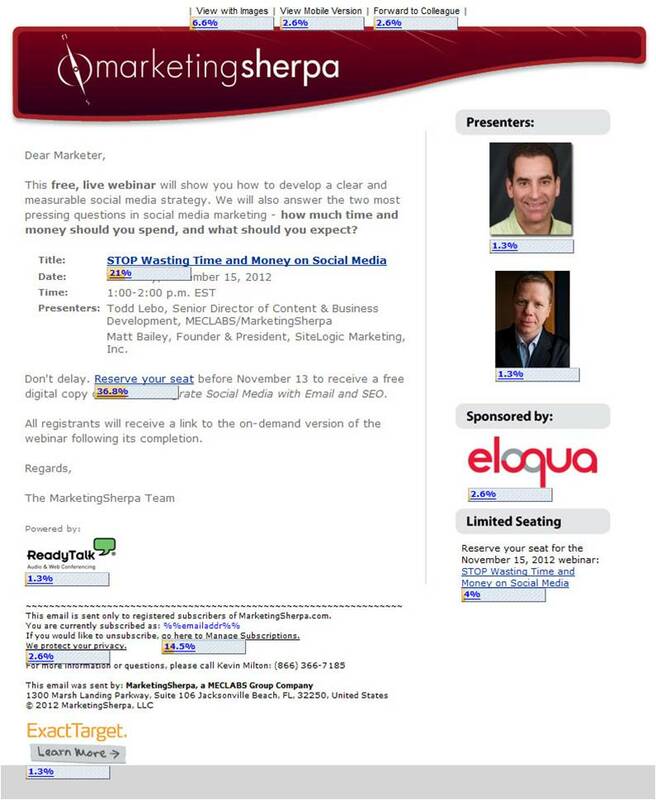 To receive the wrap-up article and replay, please sign up for the free MarketingSherpa Inbound Marketing newsletter). Jon Hosier, Senior Marketing Specialist, MECLABS, was able to achieve a 137.4% higher open rate and a 128.9% higher clickthrough rate with the personalized version. On the MarketingSherpa blog, we always try to give you the full story, showing you every angle of a campaign. So I wanted to share the reason you should take these results with a grain of salt. The list was not randomly split because this was not intended as an A/B split test, but rather a chance to personalize email for a segment of the list. This could impact results because the people Jon has full name information for might be more motivated than the people on the list for which Jon doesn’t have that info. That said, here’s what you can learn from what Jon did with his list for your own personalization efforts. Essentially, make the most of the information you have. MarketingSherpa is no exception. The site has been around since 1999. Sometimes during that 13-year span, name has been required for registering for our newsletters. And sometimes it hasn’t. Jon made the most of the information he had by tying some info he did know to an approach that leverages that information with a more personal invite. “As email marketers, we can fall into a rhythm. The problem here is that even though it breeds efficient time management, it can, at times, work against us,” Jon said. I like this example because it is so basic any marketer can do it. How can you leverage information from your database to personalize your email sends? I would add this – I am currently AB testing two subject lines – they offer the same proposition but one is a non-contentious ‘newsey’ one and the other more’ in your face’ and challenging them a little. The newsey one, as always gets a great open rate – in fact nearly double the challenging one which is still pretty good at 5%. However the challenging subject line is absolutely killing its rival in click-throughs and I am thinking that sometimes, a very high open rate in not necessarily the best way of pre-qualifying. I would be very curious to see how many of your email list have images enabled on their email clients as well. Thinking about how many marketing messages I get from opt-in campaigns that I have added to my safe senders list, I can see why the personal note approach gets more clickthroughs. Another factor that could influence this approach’s performance is the level of mystery involved in the personal note. In the template email, there are images of the presenters, a sponsor link, and a bunch of other information. I would bet that the personal note peaks the reader’s curiousity and makes them want to click through to see what you have in store for them, especially with a Webinar title like “STOP wasting time…”. The true test of this campaign is which was responsible for a higher percentage of landing page conversions. Would you share that metric? 1. The consistently higher click rates on the “Reserve” links versus the session title links. It would also be interesting to see the splits with a “P.S.” link. 2. The lower rates on the “Manage subscriptions” link in the personalized version. I wonder if the unsubscribes are also proportionately higher from the template-design version. Cool experiment. Thanks for sharing! Really nice of y’all to share this! Very helpful to see the split. The selection bias is certainly clear. I would love to see how the response rate splits based on prior indicators of engagement. Do folks who have their full names in the DB also have a history of higher open/click? What about splitting by the original sign up date of the recipients – are longer-term subscribers more likely to have clicked? I guess I would theorize that over a longer period, receiving emails from MS with some degrees of personalization create a higher level of familiarity/loyalty vs folks who just keep getting ‘Dear Marketer’. What about the open rate, was it the same for these variations/or was the subject line the same? It’s interesting to note that the second also has considerably fewer graphics. Would you be able to share any data on the devices that people were reading from? Have you found an increase in click-through’s on emails with fewer graphics?